Frank Cali, Reputed Gambino Crime Family Boss, Is Killed In N.Y. 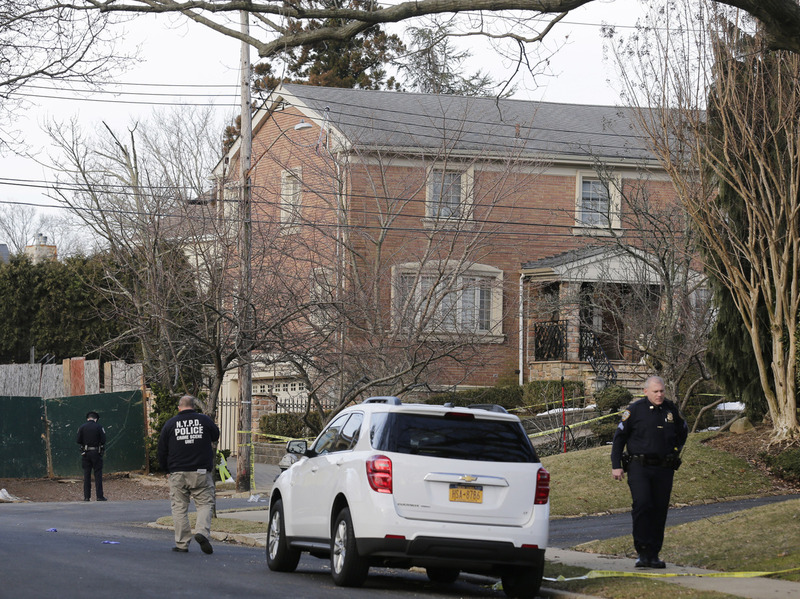 Attack In a killing that echoes mob murders of the 1980s, a man who was believed to be running a Mafia family was gunned down outside his home in Staten Island. Police walk near the scene where reputed leader of the Gambino crime family Francesco "Frank" Cali, 53, was fatally shot Wednesday night. Francesco "Frank" Cali, the reputed leader of the Gambino crime family, was shot to death outside his house in Staten Island on Wednesday night, in a killing that echoes Mafia murders of the 1980s. The New York Police Department says that at 9:17 p.m. ET, officers received a 911 call reporting an assault in progress in front of Cali's house. "Upon arrival, officers found a 53-year-old male with multiple gunshot wounds to the torso," the police said in a statement sent to NPR. Cali was taken to Staten Island University Hospital, where he was pronounced dead. Photos from the scene showed officers working around Cali's SUV on Wednesday night, with shell casings marked by overturned plastic cups. Witnesses told New York media outlets that they heard a number of shots before a blue pickup truck fled the area. Cali was commonly known as either Frank or "Franky Boy." He was believed to have had deep ties to the Mafia in Italy: As Staten Island Live reports, Cali "was born in Brooklyn and married into the Inzerillo family of Palermo and cultivated close ties with members of the Siderno cartel in Italy." Cali was first reported to be in charge of the Gambino family in 2015. The Gambino family had previously gained a high profile under the leadership of John Gotti — who orchestrated the last public killing of a Gambino crime boss in 1985, when Paul Castellano was gunned down outside of Sparks Steak House in Manhattan. Cali lived in the Todt Hill section of Staten Island, on a leafy street near the private Richmond County Country Club golf course — and not far from where Castellano lived in a mansion when he ran the Gambino family. Two miles away, at 110 Longfellow Ave., sits the house that portrayed the Corleone estate in The Godfather. In 2008, Cali and dozens of Mafia figures were arrested on federal racketeering charges. He pleaded guilty to extortion, serving 16 months in prison for his part in a scheme related to a proposal to build a NASCAR track in Staten Island. The Gambino family is one of five Mafia families that have long been seen as running Italian-American organized crime syndicates in New York. The others are the Bonanno, Colombo, Genovese and Lucchese families. "The assassination of Mr. Cali came on the same day that Joseph Cammarano Jr., the reputed acting boss of the Bonanno crime family, was acquitted at trial," The New York Times reports, "and about a week after Carmine J. Persico, a longtime boss of the Colombo crime family, died in prison at age 85."